Critics of the president’s executive actions on immigration reform go too far when they claim that immigrants are harmful to the US economy. Simplistic appeals to economic logic, gilded with nativist assumptions, hint that the arrival of millions of immigrant workers cannot help but compete for a finite number of American-based jobs. When labor supply rises, Econ 101 says that wages fall, right? Wrong. The problem with this kind of approach is that it ignores the dynamic nature of the US economy. Consider the following three charts. 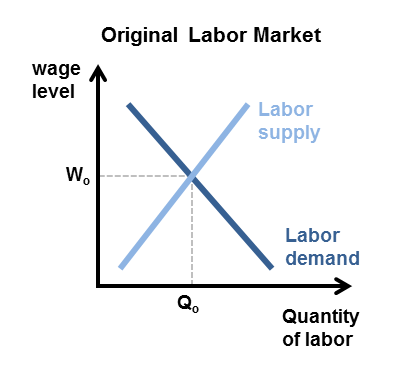 The first shows the original labor market, where the equilibrium defines the wage level (Wo) and the number of jobs (Qo) in the national economy. The second chart shows the naïve interpretation of immigration: labor supply grows, pushing the LS curve to the right. By looking at only part of the impact of immigration (the LS shift) the result is partial equilibrium analysis. This new partial equilibrium assumes everything else stays the same (such as demand for goods and thus demand for labor), yielding lower wages (Wp) and higher net jobs (Qp). 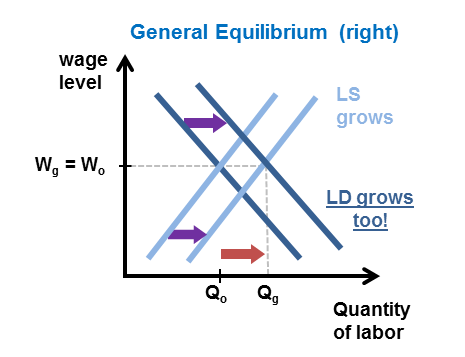 Note that the increase in LS represented by the purple arrow is larger than the increase in quantity of labor employed. That implies that the number of jobs held by the original workers went down, even though total employment went up. 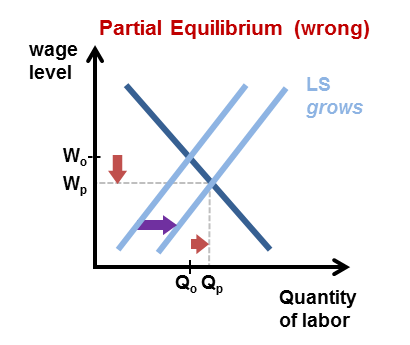 The correct analysis using general equilibrium – immigrants increase labor supply and demand for goods (and labor)–shows the wage level unchanged and that the amount of new jobs is equal to the amount of migrants. Here the size of the LS shift is matched by the size of the net new jobs, implying no displacement effect. There are many more subtleties to consider, but the third chart gets the basic point across. The mix of goods and skill levels matter, but two nuances bear consideration. First, many immigrants send a portion of their income out of the domestic economy in the form of remittances, but it is hard to know if this is materially different from domestic purchase of imports, and besides, ultimately those cash flows circulate back to demand for U.S. goods in the form of exports. Second, migrants are paid their marginal product (as is any worker), meaning that much if not most of their value added to production directly benefits the native population. Finally, if you believe that a growing economy leads to faster real wage growth due to increased productivity–a standard free-market principle established by Adam Smith’s 1776 Wealth of Nations–then it is natural to predict a general equilibrium increase in the wage level because of immigration. Two 2009 studies by Giovanni Peri and Chad Sparber found that “total immigration to the United States from 1990 to 2007 was associated with a 6.6% to 9.9% increase in real income per worker.”2 In the face of the reality that average wage levels are not negatively affected, one counterpoint is that the impact differs among skill levels (i.e., that low-skill migrants depress wages for native low-skill workers), but that is not how the world works. National and even state economies are much more dynamic than simple theory; it thus seems that immigration tends to complement native skill levels. The bottom line is that one can oppose the Obama administration’s executive actions as lawless and even harmful to long-term reform and still favor more legal immigration. When immigration reform is done right, it will use the fact-based reality that immigrants of all skill levels are good for the native economy, including wages, jobs, and economic growth. 2. Peri, Giovanni, “The Effect of Immigrants on U.S. Employment and Productivity,” FRBSF Economic Letter 2010-26, August 2010.